MILITARY CONNECTIONS WAS STARTED AS WAY TO ENSURE THAT OUR TROOPS HAVE THE SUPPLIES AND SUPPORT THEY NEED WHILE DEPLOYED. EVERY BOX THAT GOES OVER TO THE TROOPS IS APPRECIATED. EVERY PENNY COUNTS.THANK YOU FOR YOUR SUPPORT. Proud to be From Pittsburgh! 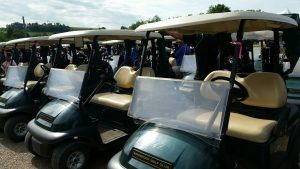 Military Connections, PGH was featured on WPXI! Thank YOU to everyone that supports our Care Package Project! Enjoy the video! Promotional Materials from your company—pens, note pads, magnets, etc. Springtime and Easter are quickly approaching. 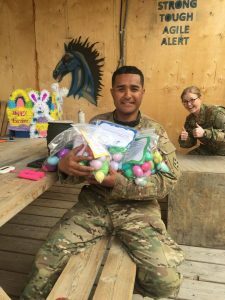 Help brighten the day of a service member by sending an “Easter Egg Hunt” overseas. For a $10.00 donation a service member overseas will receive an Easter Egg Hunt in a bag! Each bag is filled with food, snacks, and Plastic Easter Eggs filled with candy. If you would like to sponsor a service member please send $10.00 to Military Connections Corporation. Your ten dollars will cover the cost and contents of the Easter Egg Hunt. You can also include a note or picture and we will put it in the finished package. In order to make sure that the Easter Eggs reach the troops by Easter, monetary donations are needed by April 12th. Want to make your own Easter Eggs Hunt to donate? Simply take a gallon size Ziploc bag and line it with Easter Grass. Buy 12 plastic eggs (any size) fill them with candy and place them in the bag. Each Egg should have 3 to 4 pieces of candy and be stuffed full. Please remember that all candy must be wrapped! We will add the other items to make your package complete. This is a great activity for the whole family. Eggs need to be dropped off at Military Connections no later than March 21st. Please Note–We have an EXCESS of Easter Grass and are not in need of that supply in 2019. Please use Side Entrance to Enter Sale at Church. The Church is Cooking so Plan on Joining us for a quick bite to eat too! Rain or Shine! 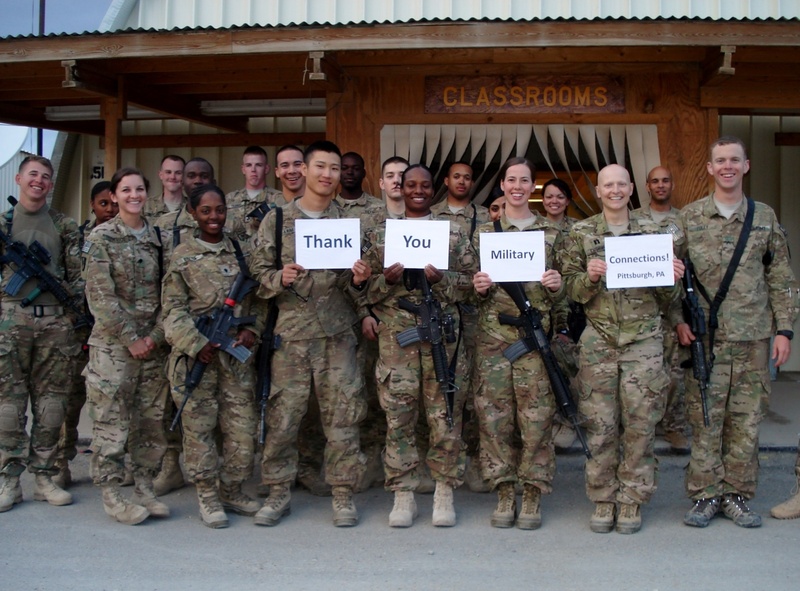 Military Connections is a non-profit organization that sends care packages to Service Members stationed overseas. Over 2000 troops are on our mailing list and we need your support! 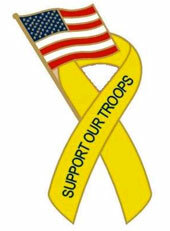 You can adopt a package to be sent to one of our men or women for a donation of $10.00. Simply fill out the bottom of the form and return it along with your donation to Military Connections. Your donation enables our organization to fill a care package with food, snacks, and healthcare supplies. A note will be included in your package to let your Soldier, Marine, Sailor, or Airman know that you adopted their package. Care Packages are a great morale booster for the troops! Military Connections In the News! Summer Tissue, Founder Military Connections, started shipping care packages because of her brother and the Marines of the 2/4. While overseas in 2004 they had minimal supplies and reached out to Summer for aid. Below is a video they shared with Military Connections upon their return. The following video contains language and content not approved for all audiences. 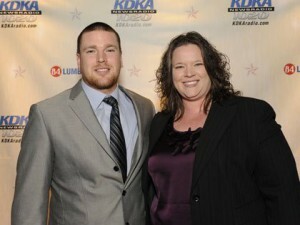 On March 7th, 2013 Summer Tissue received a KDKA NewsRadio 1020 Hometown Heroes Award. Surrounded by a cheering section of family and friends Summer accepted the award and shared her story with the attendees, many of whom were Wounded Warriors. Summer Tissue started Military Connections ten years ago because her brothers€™s unit was stationed in Iraq and was in desperate need of supplies. Military Connections ships about 600 boxes a month to the troops in Afghanistan and surrounding regions. To learn more about Military Connections and how you can support our troops overseas visit www.militaryconnections.org. “Growing up my brother and I would fight and my mom would tell us that we shouldn’t fight because one day we would not be together and should love each other while we have the chance. Of course we would always roll our eyes and shake our heads, but 21 years later I realized what she meant. The first time I drove my brother to the airport I sat and cried in the parking lot for an hour. When you put a loved one a plane headed for Iraq it’s hard to say goodbye. I was not sure how I was going to make it through his first deployment, but lucky for me there wasn’t too much down time before he called with what turned out to be my ten year mission. I didn’t start shipping care packages because I wanted to run a non-profit, or make a difference, or change the way troops lived, I did what any other sister would do. I tried to make my brother and the Marines of the 2/4 know that there were people back home supporting them. I didn’t want them to go without things such as toilet paper or Tylenol. In Order to ship the Cards in time for the Holidays please deliver cards/ letters by the dates listed below. Just wanted to send a huge thank you for you and Military Connections. I received these pics today from him, they were ecstatic! They truly enjoyed the box full of delicious treats and had a huge smile on – which put a smile on my face as well. Thank you for everything that Military Connections does to help soldiers feel a little more at home. Please accept this Flag as a token of my appreciation on behalf of my squadron, VP-46. Also included is a certificate signed by the aircrew who took this Flag on their mission against ISIS and the signatures of my Executive Officer and Commanding Officer. Your Support for Deployed Services truly impacts our morale and welfare. To you and your team, Thank You & Happy Holidays. Thank You so much for Thinking of the Wounded, ill, and injured service members here in Germany during this holiday season. We have decorated a tree with the stockings for the service member to take with them for their journey. My name is Courtney. I am currently deployed to Qatar and I am in charge of donations for the medical group here. Our medical unit recently received care packages from you and I just wanted to send an email to thank you for the support and generous donations! The medical staff and patients greatly appreciate it! It is a reminder from home that keeps us all motivated (especially during the holidays). We hope to hear from you again soon! I wanted to take a brief moment to thank everyone at Military Connections in Pittsburgh for the amazing morale package! The festive St. Patrick’s Day stockings arrived just in time to help us celebrate in true spirit. It has been said before that scent and taste have the most significant link to one’s memory, something as simple as a pack of M&M’s (something not easily obtained here) can truly change ones day! There was plenty for all of my team members to enjoy as we truly appreciate the kindness and generosity of everyone that helped to put this package together! Good morning from Kuwait. I just wanted to say that you so much for the packages that your team has been sending me here in Kuwait. I divide the packages up and give them to the Soldiers and i cannot tell how much they really appreciate all of the goodies that you send. I just wanted to take the time to say thank you and know that your support is appreciated. I hope that you have a great day. people you helped. 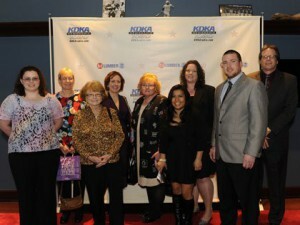 Your assistance helped make our mission a success! I want to send continued thanks to you and your team. We love the care packages and I cannot believe how much work you put into it. They are truly appreciated, and we share them with our whole unit and building. The Easter eggs just arrived and we love them! Thank you again for everything you do. I hope people tell you how much we appreciate it. It really means a lot and makes a difference over here. I would like to thank all the individuals who helped put together the stockings and snacks to TF2010 personnel in Qatar. These types of packages truly make us feel like what we do has a purpose. Thank you. 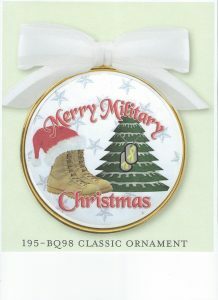 Merry Christmas to the fine folks at Military Connections. I am one of the lucky recipients of one of your holiday goodie stockings. It’s great to enjoy some holiday treats and snacks from y’all, and to know that you’re thinking of us. Many thanks! Blessings and holiday cheer from my task force to yours! Wow! We are overwhelmed by your generosity. Thank you so much for the stockings we are having a great time distributing them. They are really helping to brighten the holidays for some men and women who have been working very hard over here. It is hard to imagine it is the holidays when you are in the desert and it is still in the 90’s, so these little touches really help remind the service members that it is Christmas. It also shows them that they aren’t forgotten which is especially important this time of year. Thanks for your support! We really do appreciate it. Thank you so much for everything that you and Military Connections do. Our Squadron has received the care packages that you have been sending and can’t thank you enough. Once we received the initial group of packages I thought that would be all and have been pleasantly surprised that the packages have continued to come. I assure you that everything you have sent has been put to good use and has helped the Airmen and Marines of this Squadron. Please continue doing what you are doing and extend my thanks out to the many people and organizations that have helped in your efforts! IN JULY OF 2013 WE CELEBRATED OUR 10TH ANNIVERSARY AS AN ORGANIZATION! I JUST WANT TO THANK EVERYONE THAT HAS MADE THAT POSSIBLE. OVER THE LAST FIVE YEARS WE HAVE MAILED OVER 2 MILLION BOXES TO DEPLOYED MEN AND WOMEN AND WE AREN’T CLOSE TO BEING DONE! THE TROOPS REALLY APPRECIATE EVERYTHING THAT WE DO FOR THEM. I HAVE RECEIVED EMAILS AND THANK YOU NOTES FROM THE TROOPS EXPRESSING HOW MUCH IT MEANS TO THEM TO KNOW THAT WE SUPPORT THEIR EFFORTS. Thanks so much for the boxes of Girl Scout cookies and other food items! It was much appreciated. I can’t tell you how quickly I was jumped when I was putting the food out for everyone to take their favorites. It was actually quite entertaining. There is a lack of the “finer” foods at this new location and every little bit of home is appreciated. Thanks again for the food packages. I know everyone here is very appreciative of your support. I got the stockings tonight, and WOW! I couldn’t believe how many were in there, so I passed them out on each of the desks in my section and the next several adjacent sections last night. I did this while they were out, so they’d have a nice surprise waiting for them when they got in this morning. Everyone was shocked and thoroughly enjoyed them. I took one myself, as well, and it’s here in my room with me. Please send my thanks and thanks from everyone here to all the people involved in making and sending them. They were a nice lift to everyone’s spirit here. Summer, thank you very much for the cute stockings! They were very much appreciated and made us all feel a part of the holiday celebrations that we would usually have at home. The stockings are hanging in our little mud hut rooms! Thank you very much for the support you’ve given all of us while in country. It’s nice to know people haven’t forgotten about us 🙂 I’m sorry I haven’t been in touch more – I’m in a remote location to say the least and don’t have very good internet access. All you do for us is a treat and we are thankful for your support! We just received your gifts today. I wanted to take this opportunity to thank you (Santa), and all your elves, for your tremendous support. The gifts you provided are greatly appreciated. May your holidays be filled with joy, happiness and prosperity through the New Year; and may our Father in Heaven continue guiding your way! We have received a box with full of candy and snack on 19 March. As always, our soldiers are very grateful and motivated by your love and support, because this not just a piece of candy or a chocolate. I can guarantee for that. Hello Summer and Military Connections!!! I want to thank you so very much for everything you have sent me through out my deployment, it not only made my day, but also the others that i work with that never got anything. I especially enjoyed all of the easter candy that you sent me. I got to hand a lot of that out to everyone to uplift their spirits would you say. Anything and everything that yo sent me from toothpaste and toothbrushes, to all the soup and candy really helped me and the others. I want to extend my hand and thank you from the bottom of my heart not only from me, but from everyone else i work with. It means a lot when you recieve things from others. It feels good to know that their are others who were thinking about you and what you are doing. Honestly, I could’t thank you enough. So, thank you thank you thank you!!!!!!!!!!! As the 1SG for the 703 EOD the support we have received through Military Connections has been invaluable. This is the first deployment for half of my Company and the support and love we have felt has made a lasting impression on all of my Soldiers and has been truly been over whelming. As for many of my NCO who have been with me through other deployments the generosity we have received has set a precedence we have not experienced before. I can not say enough about how much the gifts you have donated mean to those of us downrange. 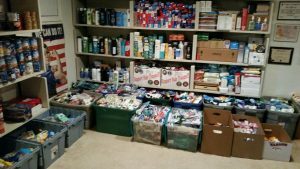 On September 11th volunteers from Military Connections unloaded a huge box truck filled with supplies and care packages from Luzerne County in Pennsylvania. This is a note from one of the soldiers that received a box from the truck.